A Twitter account linked to al Qaeda in the Arabian Peninsula (AQAP) today posted a biography of slain AQAP operative Samir Zafar Khan, founder of the terror organization’s English-language Inspire Magazine. The biography describes him as a “Pakistani-American mujahid” known in jihadist circles as Qa’qaa’ Al-Amriki. An American citizen, Khan was killed in a US drone strike in Yemen on Sept. 30, 2011 along with Islamist American cleric Anwar al Awlaki, who served as AQAP’s operational commander at the time. The biography claims that Khan was born in Riyadh, Saudi Arabia in 1985 and later spent his teenage years in Westbury, New York. He was 16 when al Qaeda carried out the 9/11 attacks on New York and Washington, DC, which Khan blamed on US policies. After the attacks, Khan allegedly refused to recite the pledge of allegiance and busied himself writing for the school newspaper, an experience that, according to the biography, aided him in his later publication of Jihad Recollections. Khan eventually relocated to Sanaa in October 2009, around the time that the final issue of Jihad Recollections was published online. His biography claims that Khan initially worked as a teacher, and that despite being followed by the FBI in Yemen he “managed to join the Muhjahideen brothers successfully.” He was mentored by “Sheikh Anwar” al Awlaki, whom the Obama administration had labeled as one of AQAP’s most dangerous leaders, and through him made many connections in Yemen’s jihadist circles. 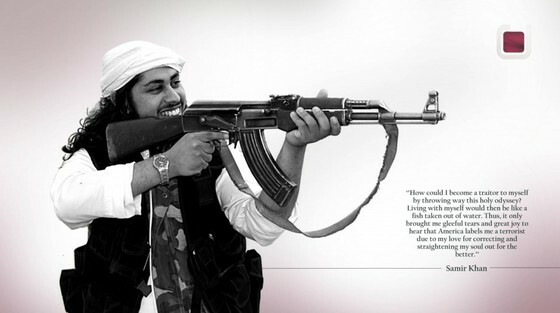 In Yemen, Khan launched Inspire Magazine, first released in the summer of 2010, and US authorities have confirmed that after his arrival in Yemen, his online efforts were coordinated with AQAP. A jihadist production, Inspire Magazine praises al Qaeda leaders such as Osama bin Laden and Ayman al Zawahiri and carries sermons by jihadist figures such as Anwar al Awlaki. The magazine regularly incites lone-wolf attacks in the West and outlines various techniques to use in attacking Americans. So that justpasteit link was the autobiography? I thought it was just bullet points to an upcoming Inspire? “Qa’qaa’ Al-Amriki”? I never heard that before, weird. The whole bio sounds odd. Anyway, we still shouldn’t have killed him without a trial. The Saudi/Pakistan connection/upbringing is very frequent in jihadi circles. Must be what they are taught at home/school/the mosque. Without drones there is only 2 ways to go. Flick your king over (forfeit) or put boots on the ground. I would. It would all depend on the nation’s commitment. Every time I see that dead punk smiling and speaking English it makes me wonder where Adam Pearlman Blah Blah went. Where are you Adam? Why don’t you show those pretty chin whiskers more, boy? You should send more stories to your pals’ er, um magazine. And be an even bigger media punk. You could be the next al Amriki splat obit. Watch out above you… it’s probably not a flying carpet. Journalist who became an activist who became a terrorist who became a grease stain. Killing guys like you is half of the work of jihad. The other half is discrediting your backwards-looking, hateful message masquerading as religion. I guess he is in a better place now, trying to lay those 72 virgins. At least he can no longer publish the lies and rubbish of the good old days.